09/12/18--13:38: _Hello. I am Shippy. Hi! With the release of this game a few days ago I wonder if someone is already working on extracting the models from this game. I got hold of the files from PC version and I suspect the models are hidden in the data.pak file. Does someone know how can I extract the .pak file? Any help would be appreciated. Thanks. I search everywhere and still nothing. I am new to re-editing games, but I'm getting more and more into it. I do have a question I would like to ask. I would like to import graphics from different games to the game I am editing. I'm running into a problem with the sprites I want to import. They are much larger than the ones in the original game. For example, I am trying to replace the ship in Defender II with a sprite I created but it's too big (especially too tall to fit). In Defender II the ship takes up 3 blocks of 8, where as the one I want to import needs more. Do I need to go into the code and change a setting? If so how? If not can you please share any suggestions? Thanks again for the help! Hopefully this made some kind of sense! I'm trying to rip the sprites from Arcana Heart 3 LOVEMAX SIXSTARS!!!!!! (Steam)using Hipster, but it gave me an error. 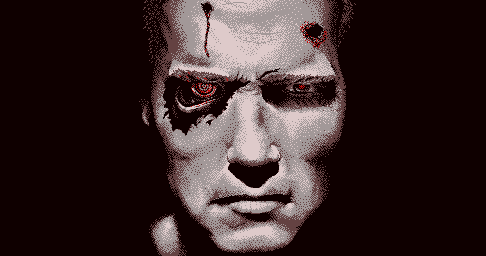 Is there any other program which extract sprites and convert from .hip to .png? 09/08/18--14:35: Super Smash Bros Arena 2 - Discord server open! Yo! Hello Yang Kai/Jio Inzagi here, I think it's about time I create a thread for this, so here I am, I'll start with a small introduction. Super Smash Bros Arena 2 is what I consider to be a "revival" of the old Super Smash Bros Rumble, that isn't avaible anymore to play or to download anywhere on the internet since Yoyogames removed all the games in their sandbox, so some day I was messing with old files of mine to clean some memory for my PC and I stumbled upon it, I then remembered it was quite a good fangame, but sadly when I looked in the internet I couldn't find the game anymore. I then decided to open the game in the old Game Maker 7 engine(which as well, you can't find anymore in the internet, yes even cracked versions, they do not exist, and the one that there is the lite version) I then decide to hack the engine and that's how it all began, over the course of adding new characters and mechanics, I got a lot better in knowing what does what and this is the main reason why some characters are way unique and better executed than others. Ok ok, enough about it, let me get you to what you want to know: the game. If you're thinking what I'm thinking I think you are thinking, then you're probably thinking "yoah! That's a lot of characters, and some obscure characters as well!" Then, yes, that is the case here. the only one really troublesome is Claire, since I'm the one making her sprites exclusively for this lol, Fuko already have sprites I ripped from a Mugen game. changed a lot of code to make the character select screen fit up to 96 characters! good idea. Instead an anime characters game with smash bros gameplay would be more unique. Started modding the original smash bros rumble engine. *Modding started 2017 temporarely tittle "Smash Strike"
09/09/18--02:44: search for nsfw sprites? is there a search term to search out the nsfw sprites? 09/12/18--13:38: Hello. I am Shippy. Hello!! My name is shipwreck, shippy for short.. and... I am a gamer. Oh wait... this.. this isn't the help desk... is it? 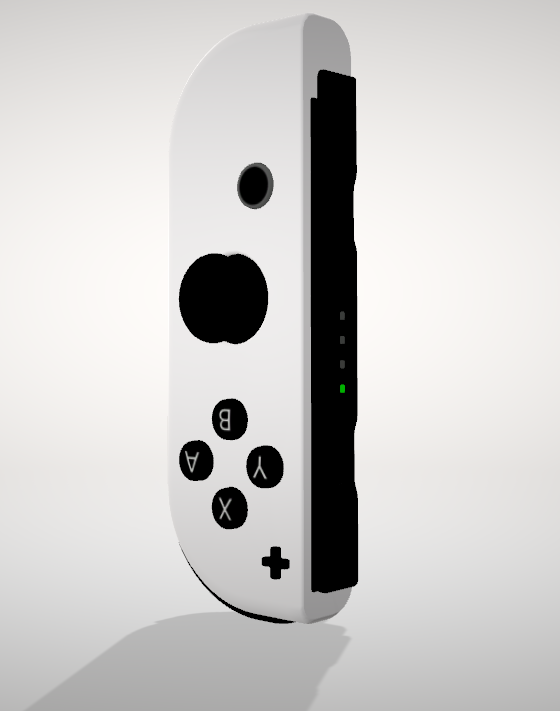 first post and I decided to make it a joycon. Ripped from Labo kit 1. Hello everyone! My name is Metroid63, or you can call me Lucky! I usually will stick to sprites, so if you all need a little help, you can send me a message! Thank you for letting me be in this server! First post here!And with that i'll be discussing a few issues i've experienced on my little "quest" to rip Sonic models. Note that most of these problems are related to my attempts at ripping the models from the game files themselves rather than using something like Ninja Ripper. First off,Sonic Riders.The models (from what i could guess) are actually on either extensionless or .DAT files,and with the research i've done i wasn't able to find a way to get the models without creating an extractor from scratch (which i have no idea how to do lmao). Sonic Free Riders is a whole different case,and i wasn't even able to find any info on it too,since all the files are either .lex or .xex files that i have no idea how to open or extract. I also tried Sonic Rivals 1-2,and i was able to go pretty far with it,but wasn't able to get the models.They seem to be inside .str files,and although i was able to open those files,the program i used was only for sound data which means the models weren't accesable. The Sonic Boom games seem to have some pretty odd issues regarding ripping.Shattered Crystal and Fire & Ice both seem to only give me a bunch of .xmb files and a log_assets text file that lists a bunch of files that weren't even extracted.As for Rise of Lyric,the only files i got were .wiiu.stream files and the only quickbms script that can extract them is unavailable due to the link for it being down. Lastly,there's Sega Superstars Tennis.Both versions i got (Wii and Xbox 360) only had a single .pac or .pak file that probably contains all the files,but i wasn't lucky on finding any info on how to extract those. Any help is appreciated if anyone happens to know how to rip these,even just pointing me to the right direction would help. Just wondering, has model ripping been perfected, or is there a certain type of file that's been considered impossible to rip. I mean, I'm new to extracting models myself, so I'm still pretty ignorant to the subject. I noticed numerous threads saying both "these are the programs that are used to rip ANY model" and people claiming that games haven't had their models ripped yet, even though those games are pretty popular. Hey, I'm darkmfalz! I'm new, but I've been skulking around tSR for years now (~12 years) -- and it's honestly been one of the best resources I had to learn how to pixel. Figured I might as well start contributing to the community! A self-portrait, why not. I think it needs some more contrast in particular areas, the neck looks ugly, and, for the love of god, I have no idea what to do with those teeth. That said, I'm rather fond of how the nose and lips turned out. It almost looks like real people. Like this one a lot better than the self-portrait. Mmm, that robot eye is definitely the crown jewel -- it took the most time, for sure. Here is the reference. 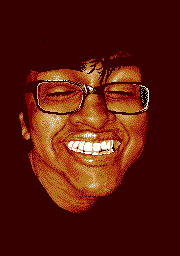 But I don't just do down-scales of photos with lots of dithering! I do real spriting too! 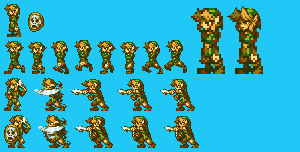 A WIP Link -- actually is based off of the Zelda II sprites, but I didn't like the results of a more traditional revamp and basically redid everything, maintaining a similar size and pose structure. If you can't tell, I discovered smear while working on the thrust animation. A big issue with this set is the readability, I think. Everything looks fine on its own (e.g. arms, torso and legs, sword, shield) but when you smoosh 'em all together, they become hard to read and distinguish -- I think that I might need to expand my palette, but I'm loath to do so until I'm sure I've done everything that can already be done w/o adding more color. A WIP Spike Spiegel -- a little less common than your Links and your Marios and your Sonics. The perspective is supposed to be similar to Nuclear Throne and Enter the Gungeon -- e.g. sideview, platformer-esque, but in a top-down world. The run cycle is taken directly from the Cowboy Bebop opening -- I actually freeze-framed and copied each of his poses and it turned out pretty neat. In terms of issues, I think this sprite runs the risk of being a dark mess because of low contrast -- I've tried to make the highlights very bright to combat this, however. I extract the .pac files using quickbms, but I'm stuck with the .cg files. Any tools how to extract them? 09/13/18--04:02: Hi! I Need help with extracting Onmyoji Arena 3d files. Hi all! I really need your help. I am very sorry if I posted in the wrong section, but I really want to learn how to do this. I am wondering, how I can extract these 3d model files from this chinese game Onmyoji Arena 5v5 Moba game. I have tried all the things that I can do as far as my knowledge goes. Sample Model I want to extract: Yoto hime and all her other skins. Please help me with these. I really need it for cosplay purposes. Thank yoou soo much in advanceee for anyone who can help me. Currently I'm trying to get models from the Transformers video games for the NDS, more specifically the 2007 & ROTF DS games. What I'm trying to rip are the following for reference & research. - The more well-known Transformers. From what I found, the 2007 DS games have .gob files, and ROTF games have .gcb files that i think are the model files. So far I used every known tutorial to find a way to rip the files, but so far, no luck. Any help will be nice. 09/14/18--06:10: 3D models with animations? Hello to all of you! I'm new here. I downloaded some models and imported them in Blender and they are awesome. But are there any animations available? I can access the armature but it doesn't seem rigged and there are no poses in the pose library or keyframes on the timeline. I'm interested in getting some poses from the animations to 3Dprint them.